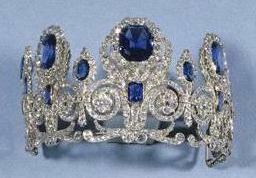 Today we have a double delight: two sapphire tiaras with similar French back stories. They're easy to confuse, so I thought we'd tackle them at the same time. Both parures you will see here belonged to Queen Marie-Amélie (1782-1866), wife of Louis Philippe, King of the French. Louis Philippe reigned from 1830-1848 before he abdicated and went into exile; he was another in the long and turbulent line of leaders that passed the rule of France back and forth during this time. 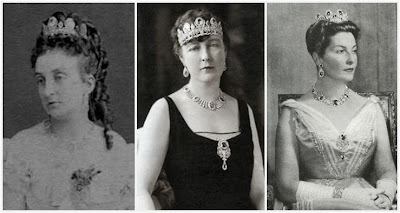 The other French tiaras we've seen to date (the rubies, the emeralds, the pearls) were crown jewels and belonged to the state, allowing them to stay in France through the changes in rule before being sold off; these two sapphire parures are a different case. They were Marie-Amélie's personal property, and stayed with her (and with her descendants) long after her husband's rule came to an end. Like many old tiaras, our first is one that has been remodeled over time, removing any signs that may once have existed indicating maker or date. Some say it had ties to Queen Marie Antoinette (1755-1793), but it more likely belonged to Empress Joséphine (1763-1814), wife of Napoleon I. 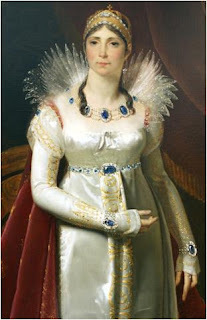 She was painted in an imposing set of sapphires, and it entered the collection of Queen Marie-Amélie when it was sold to Louis Philippe by Hortense de Beauharnais (1783-1837), who was Empress Joséphine's daughter (she was also at one point Queen consort of Holland). Hortense sold the parure to Louis Philippe in 1821, and that's the first firm record of the set’s existence. It is made of a set of large natural Ceylon sapphires and brilliant diamonds of exceptional quality, set in gold; the craftsmanship has also been noted to be quite perfect. Marie-Amélie ultimately broke some of the original parure, giving pieces as gifts to her descendants. The tiara, which included pieces that could be worn independently as brooches, was at some point reduced in size - today it measures a petite 10.7 centimeters in diameter and is 6.2 centimeters high. The parure remained with the descendants of Marie-Amélie and Louis Philippe, the Orléans family, for many decades. They gave it to their grandson Philippe, Count of Paris (1838-1894) and it passed down to his descendants until the family sold the set to the Louvre in 1985. In its museum home, the tiara and parure can now be seen alongside other reclaimed pieces of French royal history such as the Duchess of Angoulême's Emerald Tiara and Empress Eugénie's Pearl and Diamond Tiara. The parure as it exists in the Louvre today includes the sapphire and diamond tiara, the necklace of large oval sapphires surrounded by diamonds and separated by articulated diamond strings, a pair of earrings, one large brooch and a pair of smaller brooches. 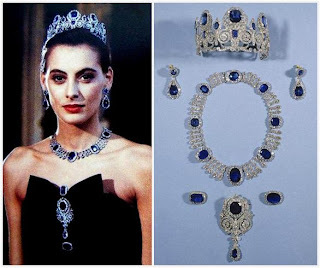 One sapphire parure was not enough for Queen Marie-Amélie, no, she had two: her second included pearls alongside diamonds and what are thought to be Sri Lankan sapphires. The tiara is a delicate piece, featuring seven oval sapphires with graduated diamond surrounds on a base of diamond festoons with pearl and sapphire accents. This one was made for Marie-Amélie from existing jewels in her collection, which were all remounted for her by Bapst. The case from Bapst still encloses the set. The sapphire and pearl parure includes the tiara, three brooches (including two identical epaulette brooches), a belt buckle or center plaque of a bracelet, and a pair of earrings. This set also passed down through the Orléans family. Marie-Amélie left it to her youngest son, Antoine, Duke of Montpensier. 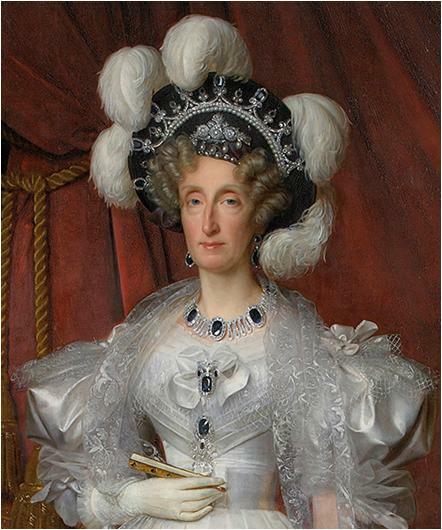 It was reunited with the above parure when Antoine’s daughter, Marie Isabelle, married her cousin, the Count of Paris. But like the above parure, this set is no longer the property of the Orléans family: the previous Count of Paris sold it in the 1990s. Which of these two tiaras is your favorite? Special thanks to Cory for contributing information! Readers' Ultimate Tiaras: Pick Your Sapphire! Readers' Ultimate Tiaras: Your Pearl Winners!